The first Soviet leader couldn’t live without this soup. Vladimir Lenin (born Ulyanov) was a figure of great contradictions. Although his father achieved the status of a hereditary nobleman, he turned against the nobility; although he was an atheist, he married Nadezha Krupskaya in the church; and while being an ascetic often living in spartan conditions, he never denied himself culinary pleasures. When he was a child, Lenin ate simple but well-prepared food. Traditional Russian dishes, like shchi (cabbage soup) and black bread, were considered beneath the family and rarely served. In his exile to the Siberian village of Shushenskoye (2801 miles east of Moscow) in 1898-1900, Lenin enjoyed fresh local products: forest game, lamb and beef, vegetables, dairy products and bread. Later, after he was living in exile abroad, Lenin also preferred healthy and tasty food: fresh meat and fish, forest game, vegetables, mushrooms and berries, as well as pickles and honey. Numerous parcels from relatives in Lenin’s hometown of Simbirsk (now Ulyanovsk; 553 miles south-east of Moscow) filled with the delicacies of the Volga, such as balyk, caviar and salmon, appeared on Lenin and Krupskaya’s table. Lenin was neither a teetotaler nor a drunkard, although he enjoyed mulled wine and punch on holidays. He was also known to appreciate a good beer — Bavarian beer abroad and Zhigulevskoye at home — accompanied by quick pickled trout and smelt. After the revolution, all the Bolsheviks were underfed. Until the mid-1920s, Lenin had to give up his former habits. But later, in the face of starvation in the country, he created a special supply of food for party functionaries: strip steaks, smoked products and sausages, caviar, coffee, pastries and sweets and the best wines and cognacs. It should be noted that the delicious dishes Lenin enjoyed were never cooked by his wife. Nadezhda Krupskaya was proud of her complete lack of culinary skills, and the family had a cook. While the recipes she prepared changed depending on the circumstances, there were dishes that Lenin could never live without. One such dish is milk soup with dumplings. Lenin’s favorite comfort food, it is easy to prepare and doesn’t require many ingredients. It’s unclear where Lenin first had this soup, but his fondness for this German dish may lie in his family background: his mother was a descendant of German protestants and brought German culinary traditions into her household. Lenin’s father, whose father had been born a serf, also had a great love of simple food. Lenin also may have been introduced to the soup in Switzerland, where he lived from 1908-1917. While in the country, Lenin and Krupskaya spent six weeks at an Alpine health retreat that had a milk diet treatment. The patients could only eat dairy products, and milk soup was a common dinner. 1. Break the eggs. Separate the yolks from the whites. Beat the whites until stiff, and the yolks until foamy. 2. Carefully mix together the whites and the yolks, then stir in the flour. 3. Boil 5 cups of milk. 4. Pour the egg-flour mass into the boiling milk and cover. Leave for 5-7 minutes. 5. The dough should rise to the surface of the milk. Turn up the heat and cover the soup again. Let simmer for 10 minutes. 6. 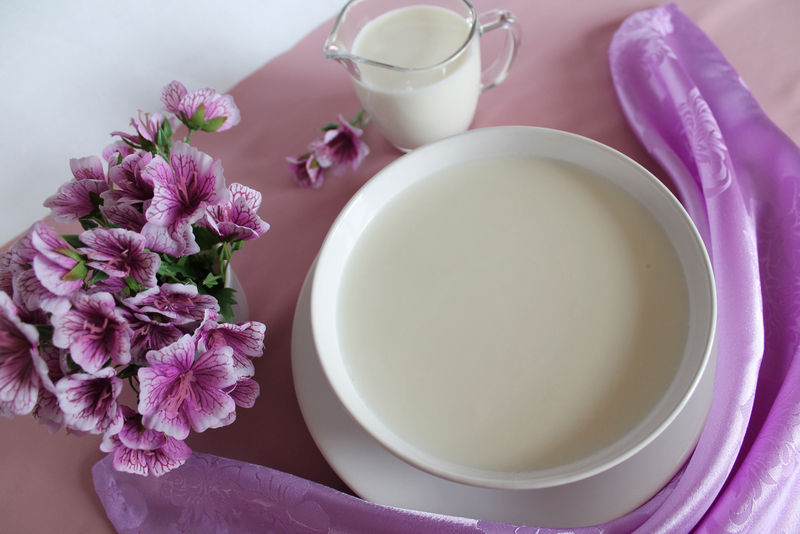 Remove the dough from the milk; cut into small pieces. 7. Pour the remaining milk into the same cooking pot, bring to a boil. Put the dumplings into the milk, bring to a boil once again. Add salt and sugar, serve hot.